Do the elements and molecules needed for creating life exist in the universe? Do we have the raw materials to build amino acids and a DNA-like molecule throughout the universe? Ever since the mid-20th century, astronomers have observed through radio and optical telescopes a great variety of the essential raw chemical elements needed to build amino acids and a DNA-like molecule. The way these raw elements in space are revealed to us is through a special technique known as spectroscopy. 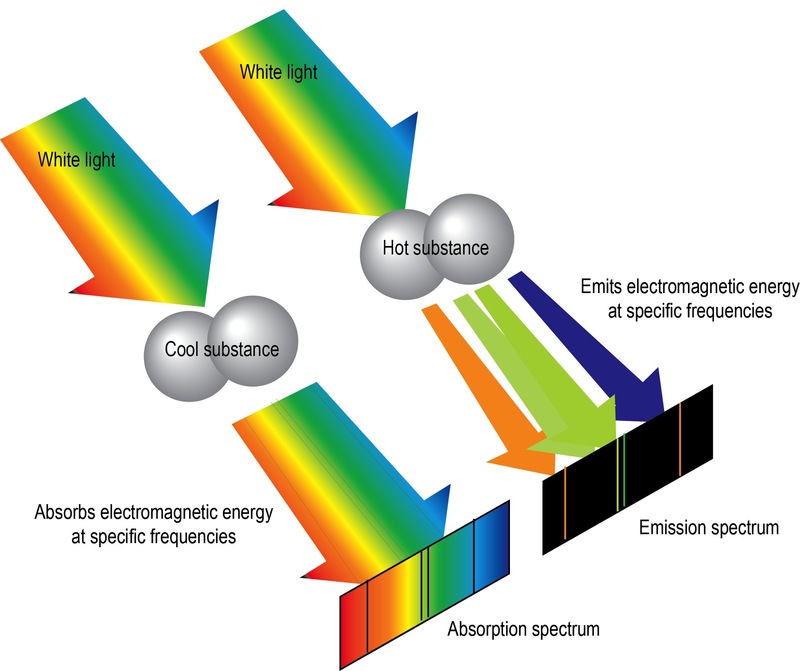 Spectroscopy is defined as the analysis of electromagnetic radiation emitted, absorbed or reflected by atoms and molecules (as revealed by dark or brightly-colored lines at specific frequencies) using a tool to help see into the radiation at different frequencies. Every atom of a particular element and every molecule of the same compound emits, absorbs and reflects radiation in its own set of unique frequencies. The way scientists determine what these unique frequencies are to help identify the atoms and molecules is by passing the radiation through a glass prism, which does the job of separating the radiation into its individual frequencies. Once the unique frequencies has been spread out onto a screen to form an absorption or emission spectrum (we call this the electromagnetic fingerprint), it can help scientists to determine not only the chemical composition of distant clouds of gas and dust, and of galactic, stellar, planetary or cometary objects at their very surfaces, but also to help reveal more subtle details such as the temperature, pressure and rate of rotation of these objects, and whether or not they have a magnetic field. 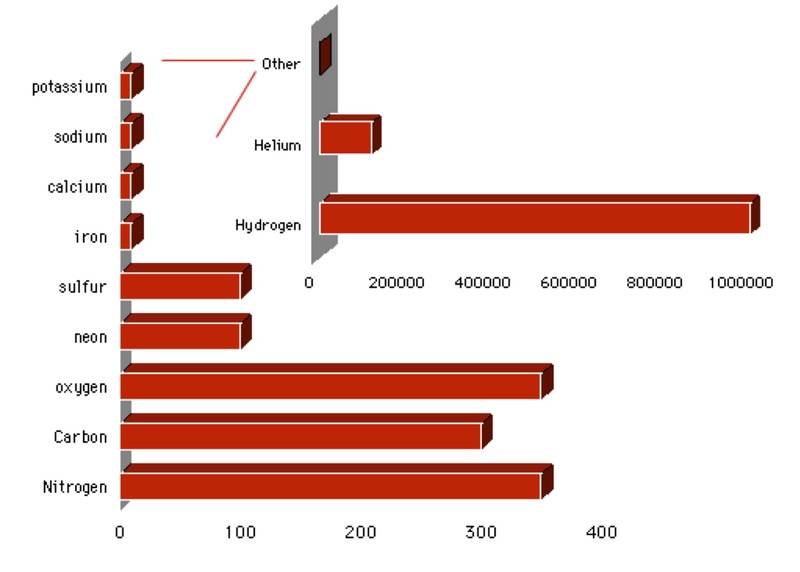 Today, the emission and absorption spectrums from nebulae, comets, stars and meteorites, scientists have found a chemical cocktail composition of mostly hydrogen, with smaller amounts of the remaining chemical elements. If we look at a typical nebula, we find that for every million hydrogen atoms in these clouds, there are about 120,000 helium atoms, a few hundred each of nitrogen, carbon and oxygen, about 100 each of neon and sulphur, and several atoms each of iron, calcium, sodium and potassium. The existence of these elements tells us we have the abundance of raw materials for creating a DNA-like molecule and any amino acid we care to forge anywhere in the universe and not just here on Earth. Do these elements come together to form molecules? Yes indeed. Scientists have uncovered out of the universal "woodwork" no less than seventy-five different molecules. Some of the molecules identified include water, methane, ammonia and the not so life-giving properties known as hydrogen cyanide. More complex molecules such as formaldehyde, ethanol, formic acid and cyanoacetylene have also been found; and there is certainly no shortage of organic molecules as well. Glycine, the simplest amino acid, is one such example of an organic molecule found in space. And only just recently, or in the 26 September 2014 research journal Science to be precise, astronomers at the Atacama Large Millimeter/sub-millimeter Array (ALMA) have noticed within the star-forming gases known as Sagittarius B2 evidence of unusual carbon-based molecules. One new molecule to be identified so far is called isopropyl cyanide. The complexity of this molecule suggests relatively complex amino acids and other important biological chemicals probably started during star formation. Need more direct evidence for the existence of organic molecules in space? Well, there exists a rare type of stony meteorite known as Carbonaceous Chondrites. A bit of a mouthful to pronounce, but these interesting meteorites contain about one percent by mass of organic matter that resembles the crude oil or tarry substances found on Earth. Although no extraterrestrial organism has been found trying to crawl out of these rocks, let alone dead ones, the total amount of organic matter in the interior of these rocks is too high to be considered entirely due to contamination with the Earth, and must show the ease by which molecules can form inside the protective confines of certain porous rocks in space. Given further protection and access to more materials, evidence is mounting to show that there are no limits to how large and complex molecules can spontaneously get. Indeed, the relative ease of producing organic molecules in space has been well demonstrated in the laboratory by a series of famous experiments conducted in 1953 by American chemist Dr Stanley Lloyd Miller (b. 1930). While working as a graduate student at the University of Chicago, USA, under the direction of Dr Harold Clayton Urey (1893-1981), Miller assembled inside a large reaction vessel an atmosphere of methane, ammonia, water vapour and hydrogen—to simulate Earth's early atmosphere. Electrical sparks reaching 60,000 volts to simulate lightning were made to pass through the mixture and, after two weeks, the body of water containing the newly-formed molecules—to simulate the early primordial pools on Earth—yielded a number of simple amino acids—organic molecules essential for the building of life. In more recent times, the experiment was repeated using a "chemical concoction consisting of carbon dioxide, water and traces of gaseous nitrogen compounds, to conform with modern theories that such gases were released from the interior of the Earth by the process of volcanism. 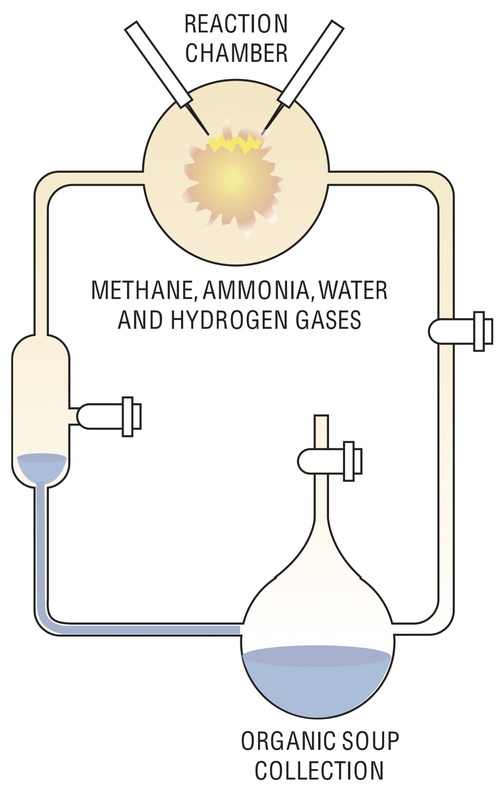 Despite these modifications to Miller's original experiment and the fact that other forms of energy were supplied to the reaction vessel such as ultraviolet light and sound waves, so long as the atmosphere inside the reaction vessel contains no free oxygen, simple amino acids were again produced with relative ease. The presence of amino acids in an experiment is certainly one thing. But to have the amino acids come together to form life is a different story. Having amino acids is not enough to state emphatically that life exists, or will arise somewhere, in the Universe. Something else has to direct these building blocks of life towards the formation of a living thing. On Earth, this mysterious organiser of the living world is called DNA. In that case, can the constituents of DNA such as adenine and guanine be produced spontaneously in the experiment? Since the days of Miller's famous experiments, a number of scientists have spent more time with the experiment and added a few more "natural" substances. What the scientists have discovered is that molecules as complex as adenine, guanine, cytosine, ribose, deoxyribose and glucose can be produced using polyphosphates as catalysts. In a more simpler experiment, Dr Juan Orò at the University of Houston, USA, managed to produce all the nucleic acid bases including adenine and cytosine as well as the usual amino acids by combining a non-oxidizing atmosphere of hydrogen cyanide with an aqueous solution of either ammonia, cyanogen or cyanoacetylene—all considered natural substances found in space. If amino acids and nucleic acid bases are relatively easy to build naturally given the right catalysts and other readily-available chemicals, do they eventually come together to form proteins and simple DNA-like molecules? There is evidence to suggest they do. In 1977, while working at the National Aeronautics and Space Administration (NASA) Ames Research Center in California, USA, Dr James Lawless and a visiting scientist from Israel, Dr Nissim Levi, found evidence to support the 1947 claim made by British physicist Dr John Desmond Bernal (1901-1971) that ordinary clay can concentrate small chemical molecules in a hot "organic soup" and act as a kind of prebiotic scaffolding for producing larger, more complex molecules at the very surface of the clay. Even though most clays have a nasty habit of destroying a number of important amino acid structures, Lawless and Levi found that clays containing metals can attract certain amino acids and nucleotides without damage. In particular, Lawless and Levi discovered two types of clays, one containing nickel and the other zinc, which not only attracts all the twenty amino acids found in living things on Earth and all the various nucleotides comprising DNA respectively, but which has been observed to form macromolecules of as many as eight amino acids and several chains of nucleotides. Longer, protein-like chains and DNA-like structures seem likely if given sufficient time for their synthesis. In yet another interesting experiment, researchers from the Center for Chemical Evolution at the Georgia Institute of Technology have discovered a chemical reaction that can occur naturally to help produce the earliest RNA-like molecules. As scientists have understood, in all animals and plants on Earth there is the all-important DNA molecule for storing genetic information inside a very stable and tough double-helix structure looking like a spiralling ladder design. Then there is another substance called RNA used in all animals to translate the code inscribed in DNA. It is essentially like DNA except it is single-stranded like a ladder cut down the middle. Beyond that there is another molecule simpler in design than RNA. Known as pre-RNA, it is considered an important molecule towards becoming a fully fledged RNA but has just stopped short of becoming one. Pre-RNA is the easiest of the three molecules  the other two being RNA and DNA  to build. Realizing this fact, researchers focused on this earlier RNA design to see whether it is possible to create it in nature using the right chemical ingredients. What the researchers have discovered is that not only is it possible to create this RNA-like molecule, but highly probable after witnessing evidence for the spontaneous bonding of the phosphate with ribose and having the structure assembled with other bases to form pre-RNA. In effect, the researchers found a chemical pathway "that we see as important for the formation of the earliest RNA-like molecules," according to the statement by biochemist Nicholas V. Hud, one of the researchers involved in the work (and also the director for the Center of Chemical Evolution). For the chemical reaction to actually take place, researchers used a molecule known as triaminopyrimidine (or TAP for short). Since this molecule can be produced naturally and in reasonable abundance, TAP was mixed with the sugar-like structure of ribose under conditions designed to closely mimic the environment of a drying pond (as can easily happen should the rains of early Earth stop falling and enough time is provided for the water on the ground to dry up). This slow removal of water and increasing concentrations of various chemicals, especially the ones of interest to the researchers, somehow managed to help assemble a basic RNA-like structure. Observations suggest up to 80 per cent of TAP reacted with ribose to form the all-important nucleotide structure (i.e., the fundamental base-sugar-phosphate unit structure for creating a DNA-like molecule). "It is amazing that these nucleosides and bases actually assemble on their own, as life today requires complex enzymes to bring together RNA building blocks and to spatially order them prior to polymerization," said Brian Cafferty, a graduate student at Georgia Tech and co-author of the study. The study was published on 14 December 2013in Journal of the American Chemical Society under the title "Spontaneous Prebiotic Formation of a β-Ribofuranoside That Self-Assembles with a Complementary Heterocycle". Despite all this interesting work, scientists have yet to witness a self-replicating macromolecule like DNA spontaneously come to fruition before their very eyes that will eventually lead to the formation of a living organism. The process leading to this final important step is apparently too slow (perhaps taking hundreds of millions of years) and there seems to be little the scientists can do to speed-up the process in the laboratory. Assuming life did arise naturally here on Earth, one important scientific work being conducted in this area in the attempt to speed up the process is the one from Professor David Deamer of the University of California, Santa Cruz. "So we think that vesicles were very much part of the first forms of cellular life. All life today is cellular, it means a membrane surrounding a compartment. And what we are doing here is stepping through the evolutionary process that must have occurred on the Earth about 3.5 billion years ago when the first forms of cellular life appeared." "Is it alive? Not yet. But it's a shared goal of a number of laboratories now to actually make artificial life." Can making bubbles help to make new life? Perhaps in a typical bathtub of people's homes, some soap and a bit of baked beans. But in the early days of the Earth? We will have to wait and see. As with any good scientific argument, there should always be an opposing view. Indeed, should the time provided by Earth be not long enough to create a self-replicating DNA, there is another way. First proposed by Professor Chandra Wickramasinghe of Cardiff University in the UK with support from his scientific colleague Sir Fred Hoyle, the idea involves the possibility that Earth could have been seeded by an alien bacteria with its own alien DNA hitching a ride on an icy comet and crashing on the planet over 4.6 billion years ago. It is not unlike the way a sperm carrying its own self-replicating DNA arrives on the surface of an ovum to kickstart life. But now a kind of silence of the clowns has taken place as more scientists take the idea seriously. The interest is particularly well-founded in recent times when we realise microorganisms on Earth can and will survive at the heart of, say, a nuclear reactor. These extremophile creatures were detected surviving and eating holes in the stainless steel cylinders inside highly alkaline water in the presence of spent nuclear fuel rods. Also, bacteria frozen in the deep ice of Antarctica for tens of thousands of years can be revived at room temperature in the laboratory today. So why not millions or hundreds of millions of years? This means that in space, bacteria can survive. In fact, Earthly bacteria is said to be thriving on the Moon thanks to the successful Apollo mission in 1969 to land on the celestial surface. Perhaps this might explain why the U.S. Administration are not so keen to get back to the Moon in a hurry. At any rate, if bacteria can survive in space, why not in another part of the universe? NASA has looked into this issue with more than a glancing interest. After carrying out some tests, the explanation has convinced enough scientists to the point where they are looking more closely for the evidence in space. The only problem is where. Since the Moon is contaminated with Earthly bugs at this point in time, and probably Mars as well after the landing of several probes on its surface, NASA wants to send another probe to a more pristine environment in space. NASA's first attempt to gather the evidence began in 2003 and repeated in 2006 when it sent into space a US$158 million (A$300 million) spacecraft called Contour (short for COmet Nucleus TOUR) designed to analyse the icy material in the nucleus of two comets - Comet Encke in 2003 and Comet Schwassmann-Wachmann 3 in 2006. The results were inconclusive. Perhaps the quantities of alien bacteria were too small and/or hidden deep inside the comets? Not deterred by the results, NASA has realized that maybe all it would take is for one of these comets to land in a place where an alien bacteria could, in the right environment, multiply into quantities that can be detected by the scientists. Therefore, a plan is underway to send a probe to Europa in 2018. Why? Because the moon is believed to have liquid water underneath its icy surface and should have collected enough icy comets over billions of years to determine whether the panspermia theory is a reality or not. The idea that life could exist on Europa is credited to astronomer Guy Consolmagno SJ, now the curator of the Vatican's own astronomy observatory outside Rome, Italy. In his early work at MIT to determine the internal structure of the outer moons of the solar system using computer modeling, he jokingly thought and wrote in his Masters thesis how it might be possible for little bugs to be swimming in the liquid oceans of water below the icy crust of Europa. NASA is not quite laughing. In fact, NASA is determined to find out if this theory is true. Until scientists explore this moon thoroughly, we can only speculate on the possibilities. And hope at the same time we do not contaminate Europa with our own bacteria to spoil the results. Or would scientists be better off finding more advanced alien life we can observe with our eyes to avoid this contamination possibility? This contamination issue discussed above does raise an important point. What if our technology cannot physically determine whether a bacteria is Earthly or not? If the panspermia theory for the origin of life on Earth ends up being true, maybe an alien DNA-like molecule that started life on Earth is no different from our own DNA. The potential is there for all DNA molecules frozen in an icy comet to have the same nucleotide structure. In which case, can we be sure we have found the ETs? The only way to be certain is if life on another world develops to a sufficient level of complexity that will allow our own eyes to observe without the use of instruments. While scientists may say an alien bacteria is all the evidence they need, the reality to prove it is alien could be much harder than they think. The risk of Earthly contamination of distant worlds by man-made probes would only make the task harder and leave behind more questions than answers. But if the alien life is already highly evolved and visible to the naked eye, it makes it impossible to claim contamination so soon after the discovery. Scientists would have to conclude ETs do exist. Isn't it time scientists start solving the problem of interstellar travel to get the conclusive proof? BBC Horizon documentary titled We Are the Aliens 2006 (Scotland Production).